The death of a former serviceman who fell 4m (13ft) from a roof at a retail park while cleaning guttering has been ruled as misadventure by a coroner. 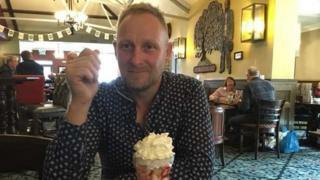 Stuart Carter, 47, of Cambridgeshire, was working for a roofing and construction firm when he fell from the top of The Range, Ipswich, on 3 August. The father-of-one, who had previously been in the Royal Logistic Corps, died in hospital 18 days later. Inquest jurors were told Mr Carter “always took safety seriously”. The inquest in Ipswich heard Mr Carter had been working for St Neots-based GC Services Ltd, alongside Andrew Griffiths, clearing the guttering of the garden centre at the back of The Range store on Suffolk Retail Park on London Road. The jury heard Mr Carter had walked the length of the gutter and had “cornered himself in the corner of the roof” by mistake while cleaning it. He fell “headfirst” from the roof. Mr Carter, from Little Paxton, near St Neots, was taken to Addenbrooke’s Hospital in Cambridge, where he died on 21 August. His cause of death was given as a brain injury following a fall from height. Suffolk coroner Nigel Parsley ruled the death as misadventure.